Today, we have a guest post by Bill Simmons. Bill is a retired health inspector blogging about public and environmental health at http://pehealthnj.blogspot.com/ and on Twitter as BillSimmonsNJ. I asked Bill to Guest post after I heard him raise an interesting set of issues during the public comment period of last week’s monthly meeting of the NJ Water Supply Advisory Council about studies on stream base flow and land use. Base flow is an important aspect of fundamental hydrology and critical to water quality, quantity and the ecological health of our watersheds. Both NJ Acting State Geologist Hoffman and USGS representative on WSAC were aware of the research Bill summarized and interested in conducting watershed scale studies to get a better understanding, but lack funds to conduct that research due to diversion of research funds by the “Keep It Green” open space ballot deception (just one of the many water resource cuts we warned about that have yet to be restored in DEP’s budget). Did you know that increasing impervious surface in a watershed is clearly linked with higher storm flow – but not with lower baseflow? And that this was first reported in NJ about ten years ago? In developed watersheds, baseflow isn’t just baseflow anymore. 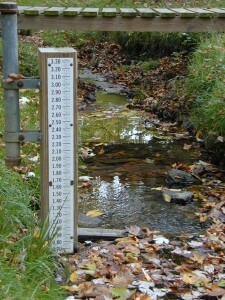 That means baseflow doesn’t predict water levels in the water-table aquifer the stream runs through. You could have adequate baseflow but still have headwater wetlands and shallow wells drying up during a drought. The most nuanced paper was published last year as part of the Baltimore Ecosystem Study: “Baseflow signatures of Sustainable Water Resources. An Analysis of Maryland Streamflow”. Figure 9 on page 37 compares the traditional model of baseflow – recharge in, baseflow out – with urbanized baseflow derived from multiple processes. Some “artificial” sources of baseflow are essentially interbasin transfers that obscure the volume of baseflow that naturally flows from the water-table aquifer. Wastewater treatment plants can discharge effluent into a stream that is derived from sources outside the watershed, “bypassing the groundwater system”. Old urban drinking-water pipes can recharge the water-table aquifer with pressurized water that came from sources outside the watershed. To a lesser degree, even watering your lawn can artificially recharge the water-table aquifer, if your well is drilled deeply into a separate, confined aquifer that recharges far from the watershed and the water-table aquifer the well is drilled through. Groundwater can leak into sewer pipes in one watershed (I&I – Infiltration and inflow) but discharge from the treatment plant into another. 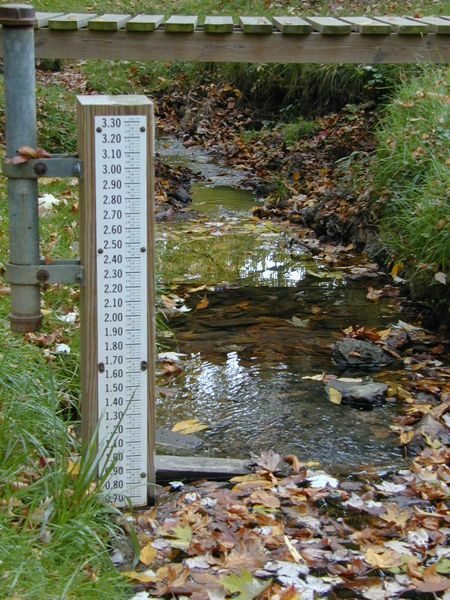 When a watershed is developed, how can a stream gage tell you if natural baseflow has decreased – with all these artificial sources of baseflow? That answers “where do we go from here” for New Jersey as well. We need to find out the unique combination of natural and artificial baseflow in urbanized watersheds, so we can understand their specific vulnerabilities to drought. When we can isolate natural baseflow from artificial baseflow, we can make informed regulatory decisions about water allocation. Should the “unintended interbasin transfer” part of baseflow be counted or excluded when deciding how much water can be safely permitted to be withdrawn from a watershed? Imagine a river – that is overly-dependent on treated wastewater for maintaining its baseflow – drying up someday because the municipalities discharging their waste to the treatment plant implemented a successful water conservation program, in another watershed. Baseflow data measured by a system of stream gages alone has become a black box. We need a “more process-based understanding of [our] coupled surface water- groundwater resource.” Baseflow data needs to be augmented by data from a system of monitoring wells in the watershed that record the levels of the water-table aquifer – especially in the headwaters. But that’s expensive, and there are less funding sources in NJ for these research programs. So for now this ends up on the what-if list for climate change, or as another reason for updating the 1996 NJ Water Supply Management Plan, or something, until it gets funded.